Before I adopted a Paleo diet, I usually took a turkey sandwich on whole wheat bread (with avocado if I had any) to work for lunch. I’d have raw veggies on the side, a small piece of fruit and maybe a small piece of dark chocolate. I considered this a healthy and satisfying lunch that I really didn’t mind eating every day. Sometimes I would take a salad, but it seemed like so much work. 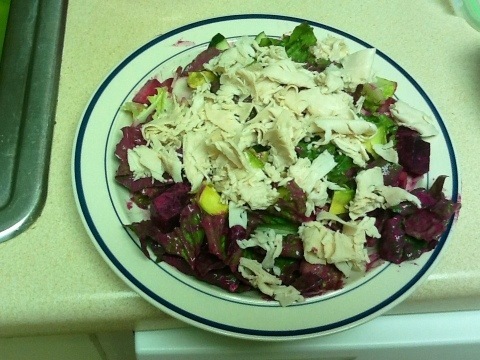 When I started eating Paleo I decided that I would have to get over it and just make the time to make a salad. One of my hang-ups with a salad is that I really prefer it freshly made (I am the same way about sandwiches). I have tried taking all the ingredients and making my salad at work, but that is so time consuming! 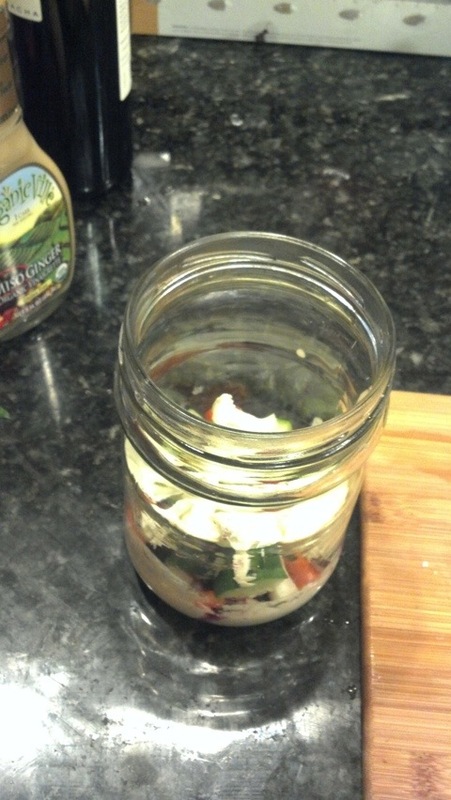 Pinterest gave me another good idea – salad in a jar! This combines 2 of my favorite things: fresh food simply prepared and reusing glass containers. There really is no recipe for this. This does work best with a thinner salad dressing. I often just use a tablespoon of olive oil and a tablespoon of balsamic vinegar. 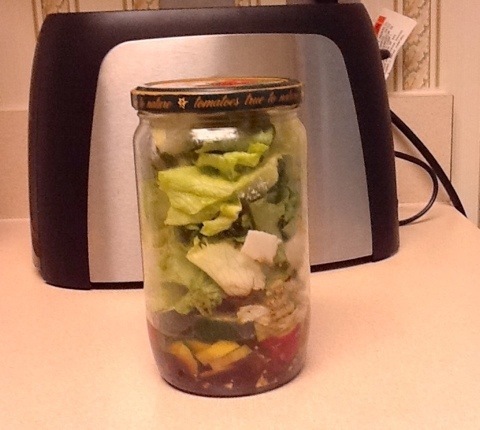 Choose a large glass jar (2 cup+) for a main dish salad. I often make two salads at a time. They stay fresh for 2-3 days. 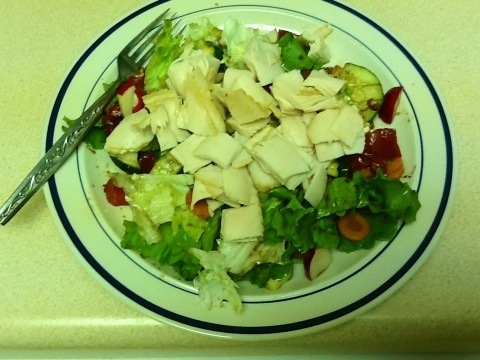 Add your salad dressing first. Thin it with lemon juice or vinegar if necessary. Don’t turn your back on it if you have hungry family members lurking about! Add your salad toppings. If you are using cheese, add it first. Feta cheese is superb marinated in vinegar and oil. Beets (if using) are next. Try this incredible marinated beets recipe from Nom Nom Paleo. 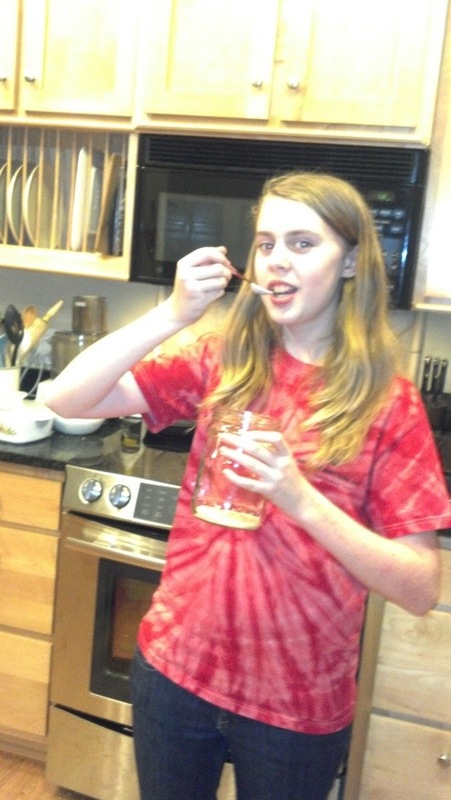 I used to buy pickled beets but started making my own when I realized that they contained high-fructose corn syrup. Next add the rest of your vegetable toppings, moistest ingredients first. Top off the jar with salad greens. Don’t be afraid to stuff them in! It’s best if they are thoroughly dried. 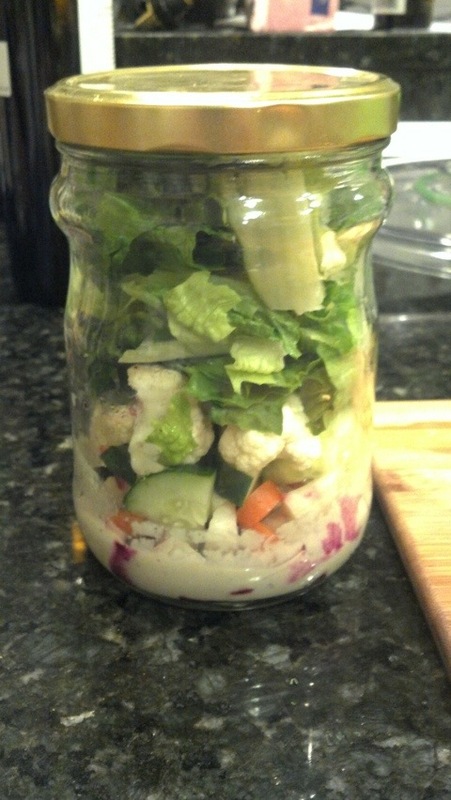 I just love how the salad looks in the jar. 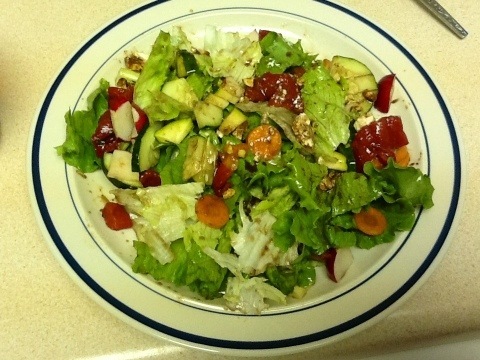 Dump the salad out onto a plate. 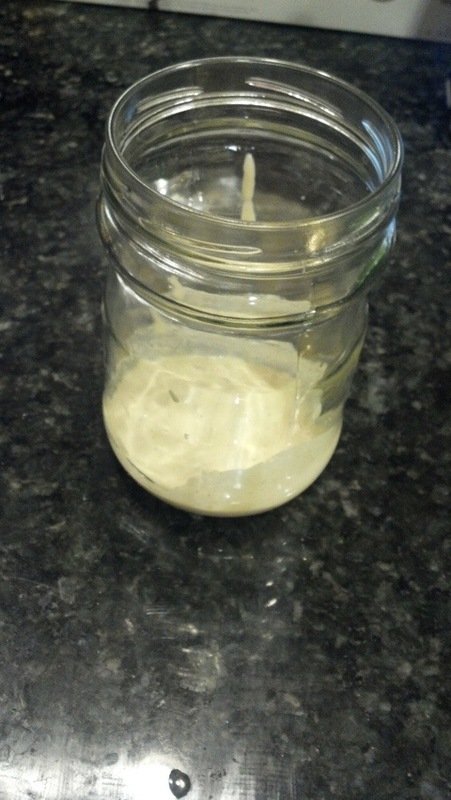 If a lot of the dressing sticks to the bottom, put some of the salad greens back into the jar and shake vigorously. 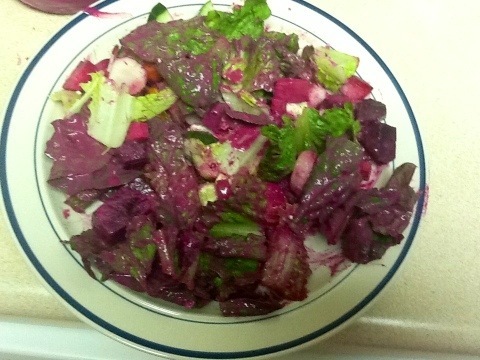 The beets turned my ginger dressing a brilliant hue of magenta! I add the meat separately because I like to add plenty of it. Sometimes I prefer to heat the meat up first. Yesterday I took the leftover flat iron steak with balsamic reduction to top my salad. I also pack avocado separately since it browns quickly. If anyone tries this, I’d love to see pictures! Looks wonderful. Love a great salad at lunch, it’s so satisfying. Do you make a couple at a time or make it fresh every day. We had a great salmon dinner tonight, so will try the salmon cakes with the leftovers and with a few coconut bones. If I have 2 large jars available I’ll make 2 at a time. Hope you enjoy the salmon cakes.